Companies across Britain implement Crossrail lorry safety requirements - Crossrail . For information about the Elizabeth line please visit the Transport for London website. Crossrail hosts cycle safety event at Marble Arch today allowing cyclists to take to the driver’s seat. Crossrail’s contract requirements have enabled thousands of HGVs working on the project to become safer by fitting safety equipment added to each vehicle at an average cost of around £1,250. It comes as Crossrail provides cyclists with a chance to take to a lorry driver’s seat at Marble Arch today. The Exchanging Places event is one of a series of joint Crossrail and police road safety initiatives being held on London roads and in schools, designed to give cyclists an understanding of blind spots faced by HGV drivers. The Mayor of London’s recently published ‘Vision for cycling in London’ details how Crossrail, alongside the GLA and Transport for London (TfL) is using its supply chain contracts to ensure companies are adopting these safety measures. More widely, TfL is working to make all construction vehicles across London safer and cleaner for all. 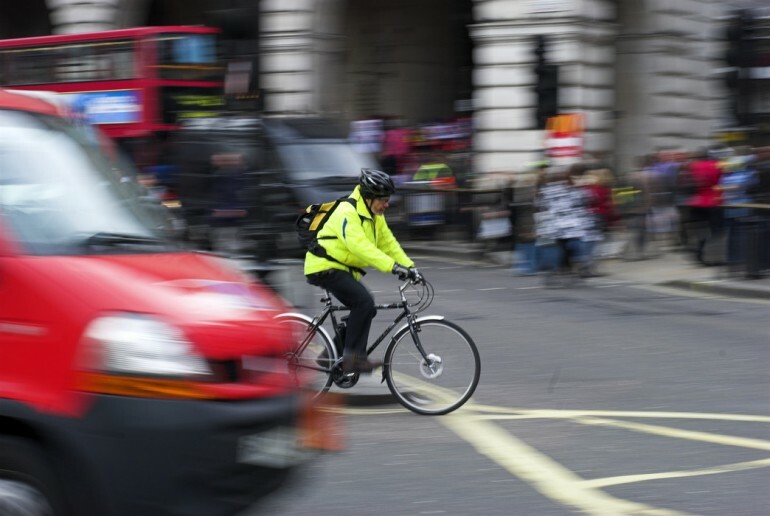 Earlier this week, a Cycle Safety Toolkit for fleet operators was published by TfL, providing practical advice to help them further minimise the risk of collisions between vehicles and vulnerable road users on the Capital’s roads. Crossrail requires all HGVs delivering to its worksites to have cycle safety equipment and for regular drivers to undergo a one day intensive training course regarding vulnerable road users. Lorries are inspected when arriving at site to ensure the required safety equipment is fitted and in working order. Crossrail requirements include that HGVs are fitted with Fresnel lenses or cameras, blind spot detection equipment which warns the driver when a cyclist is in the near-side blind spot and under-run guards to prevent cyclists from coming into contact with lorry wheels. Vehicles must also carry warning signs to alert cyclists and pedestrians of the risks they face by getting too close to HGVs. TfL Director of Planning, Surface Transport, Ben Plowden said: “Cycling in London has risen by 173 per cent since 2001 and we are working hard to double that figure in the next 10 years. Through the Exchanging Places programme, we can give cyclists and HGV drivers the chance to put themselves in each other’s shoes, focusing on the dangers and risks of collisions between cyclists and HGV drivers. The required safety measures are part of a programme that Crossrail has implemented to help make roads safer for vulnerable road users in the capital and beyond. More than 4,700 drivers have now completed Crossrail’s Lorry Driver Training course covering vulnerable road users. TfL has adopted Work Related Road Risk cycle safety requirements in its contracts as piloted by Crossrail. In TfL’s generic requirement, the Crossrail specific driver training has been replaced with the TfL Safe Urban Driving DCPC accredited training with an on-cycle hazard awareness module. The driver training requirement has also been extended from just lorry drivers to additionally include van drivers. TfL also requires contractors to undertake driver licence checks with the DVLA and the TfL WRRR requirements make no exemptions for courier vehicles. TfL’s WRRR cycle safety requirements have been adopted by all parts of TfL and the London Legacy Development Corporation, are being promoted to all London boroughs for use in their own procurement practices, and are imbedded within the new TfL guidance on Construction Logistics Plans. More information is available on-line at www.fors-online.org.uk and in the TfL guidance documents ‘Improving roads safety through procurement’, ‘Construction Logistics Plan Guidance for planners’ and ‘Construction Logistics Plan Guidance for developers’. TfL continues to actively engage with local, national and European governments to adopt strict safety standards and have cycle specific safety equipment, including side-bars, blind spot mirrors and detection equipment fitted as standard to reduce the risk of collisions on the capital’s roads.